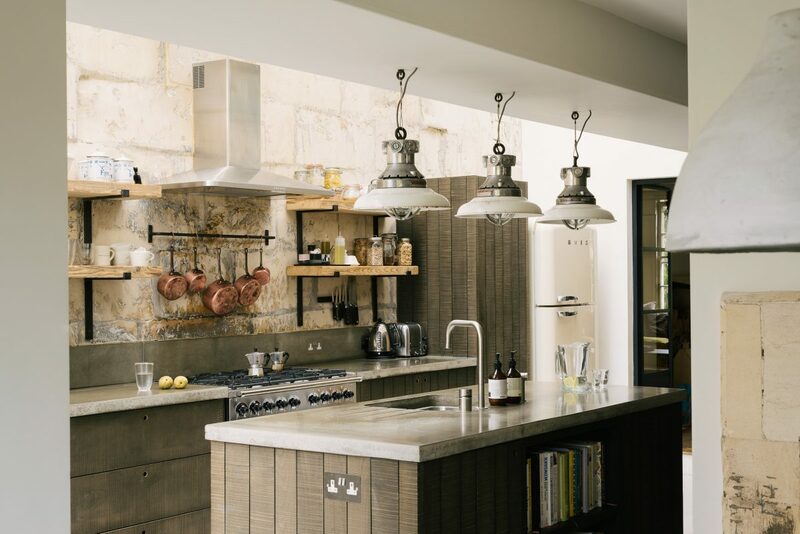 A fashionista and a chef go for our Sebastian Cox Kitchen, we ask them why? 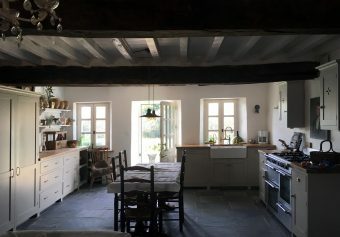 Tim and I often go out on the road when the weather gets better and visit some of our customers in their homes and take photographs of their kitchens for our website and for adverts in our favourite magazines and for our wonderfully dedicated Instagram followers. We love the whole image thing, seeing all our new kitchens pop up on our Instagram and reading the comments is such a fabulously instant and interactive way of communicating. I know it’s not everything but it really helps us to get to people all over the world and to inspire and to excite them. We have followers literally everywhere, our top twenty has all the big places like New York and Sydney but we also gather so many followers from really exciting places like Santiago, Istanbul and Seoul. Social media is such a massive thing for us here at deVOL and our perfect little team, Zoe, Letty and Holly, have become so good at it that they win awards. The Bath, Larkhall Kitchen, practicality and style in equal measures. 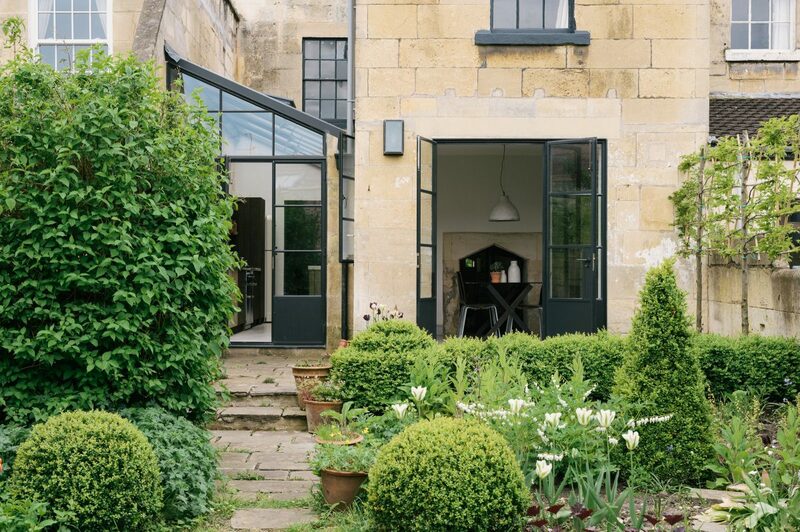 A seamless Bath Stone wall with elegant Crittall-style windows and simple Sebastian Cox cupboards. 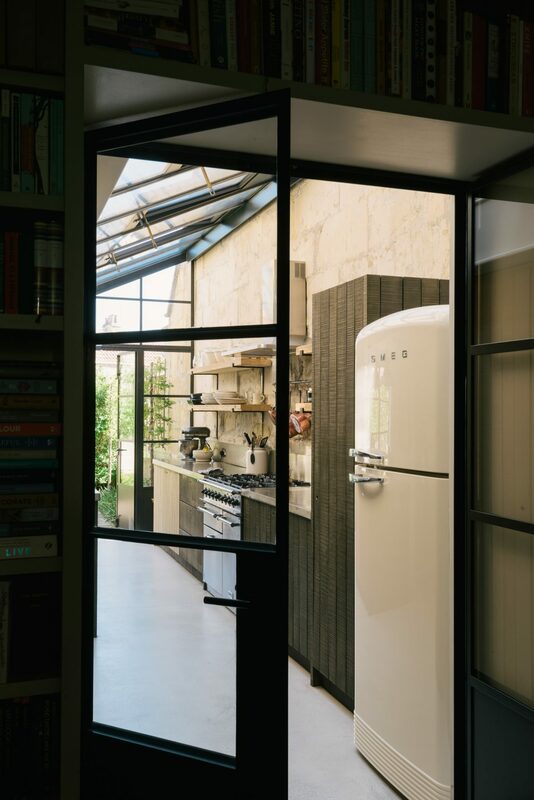 One couple, Hannah and Michael Holloway, have recently had a deVOL ‘Sebastian Cox Kitchen’ fitted in Larkhall, a delightful little enclave in Bath and we organised to go and take photographs. They suggested a little social media and a blog rather than a gift and we thought what a great idea. Luckily for us they were truly lovely, creative and very stylish and their businesses were really special too, not to mention their uber stylish kitchen, which as you can see from the pic above has gone on to top our Instagram charts with a whopping 9,419 likes to date and 81 messages of true love!!! 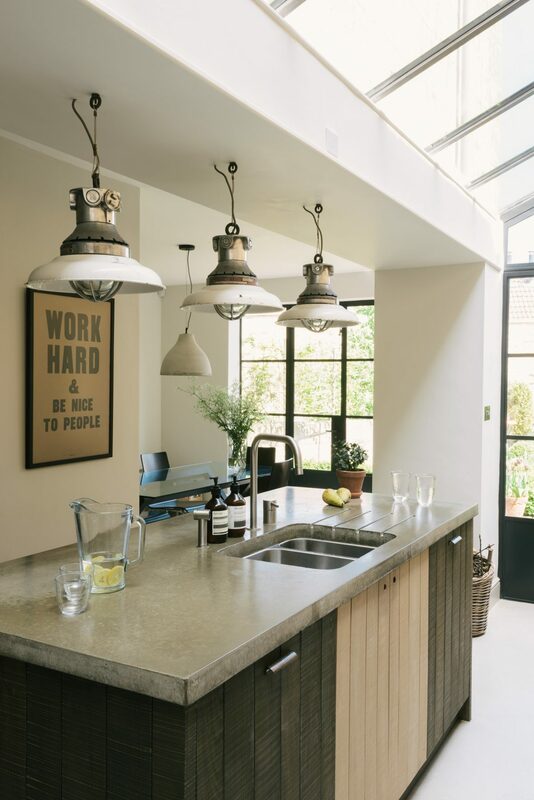 Industrial lights, bare brick walls, copper pans and concrete worktops. Hannah and Michael in their Sebastian Cox Kitchen. Kitchens are so important to Michael as he is a chef and he welcomes prospective clients into his home to enjoy his food, his hospitality and his home. This is often couples looking for an extra special person to create the food for their wedding day. Imagine arriving in this kitchen, sitting down and being fed wonderful food by Michael in his home. Such a lovely unique approach, very personal and of course you have to have a very impressive, cool and hard-working kitchen. We are so happy that our kitchens are becoming so popular with professional chefs, it’s such a positive message. His website is great too, take a look at ‘Wild Fork West’ here. Three industrial pendant lights hang above the lovely island. Helen – Did you have a set idea of how you wanted the kitchen to be? Michael: Sure, lots! In contrast to Hannah’s aesthetic concerns, for me, it had to function well as a space to make and enjoy food. For example, the most important tools and ingredients must be the most accessible. If you repeat the same task countless times, it should feel seamless rather than clunky. Of course, having a clear sense for the many different tasks you’ll want to do is vital to determine priorities. Only then can you design the space accurately. Helen – Is it hard switching from a commercial/restaurant kitchen to your home one? Michael: Not necessarily, it just depends what you are trying to do. I work as a private chef so spend a lot of my work-life in family kitchens. The food depends more on your ingredients, technique and preparation than the equipment and surroundings. I love impressing clients with what can be done in their home kitchen! Everything is out on open shelves and easy to get, one of Michael’s top priorities. Helen – Do people expect you to have a fancy kitchen therefore they don’t give you so much credit for creating such an amazing space!!!? Michael: I host tasting meals – for weddings – at home and clients are always amazed at how beautiful the kitchen is. And I always credit Hannah’s ideas and the fantastic craftsman, Andrew’s execution with creating the amazing space! The spot you sit for a special meal prepared by Michael. 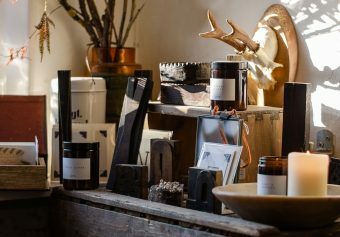 Helen – How hard is it to move from London Fields in Hackney, a very hip part of London, where you can get the best ingredients, go to the coolest places and feel like you are on it with trends and everything and everyone that’s new – and moving to Bath? Michael: London Fields and Hackney is unique and I still love to visit for inspiration but now we have a young family, Larkhall is just perfect for us. Helen – What’s your favourite restaurant/food in London? Michael: The abundance of markets and street food is much more developed than Bath or even Bristol. St John was probably my favourite place to eat. Helen – How long have you been into food and cooking, is it your only passion apart from your family? Michael: I have always loved food and eating so switched away from a career in legal reform to cooking. It felt like a huge risk but my family were supportive and I’ve never looked back. It is just so satisfying to turn great ingredients into beautiful meals that bring people together, whatever the occasion. Hannah and Michael in their beautiful new deVOL Kitchen. Hannah is lovely, she exudes style and confidence and she has made her home the same, a comfortable, beautiful, easy place, full of really nice things, everywhere. She has been surrounded by style all her life, her parents’ homes have graced the front covers of magazines over the years. Hannah and her family run, yes you guessed it, a very stylish fashion company called Maze! They have been doing it since 1985 and have some very smart shops in Bath and Bristol and a very successful online business selling high end, slightly edgy, fashion with a beautifully curated wardrobe of lesser know very good quality clothing and accessories. Hannah definitely must have carefully considered what kitchen to buy. 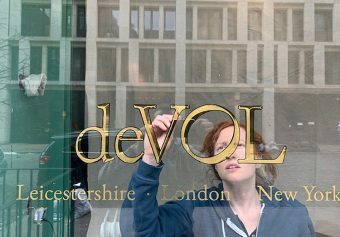 Helen – How did you hear about deVOL? Hannah: I came across deVOL in Elle Decoration. I love interiors magazines and I have a rather large stack that I constantly refer to. We were living in London at the time, with no plans to move, but I knew straight away that deVOL would be top of my list when we did! I still have that magazine with the page corner turned down. Helen – What drew you to the Sebastian Cox design? 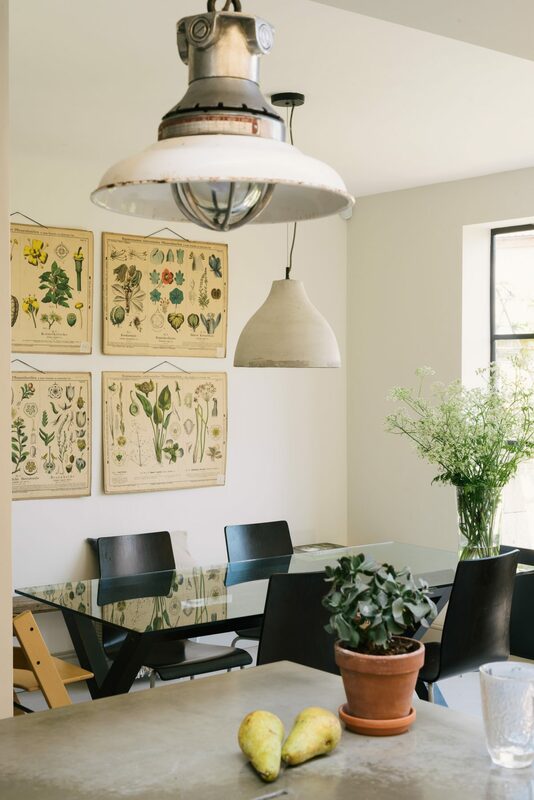 Hannah: The Sebastian Cox Kitchen didn’t exist when I first came across deVOL, but as soon I saw it I knew it was the one for me. I love everything about it – the beautiful wash of colours, the understated simplicity of the design, the copper highlights, the tactile quality of the materials and the elegant craftsmanship. I think it’s beautiful and like all good design, it’s incredibly pleasing to be around. It seems to be quite unique and fits perfectly with the modern rustic aesthetic I wanted to achieve. Hannah has a wonderful eye for everything, even her garden is spectacular! Helen – Did you visit our Cotes Mill or London showroom? Hannah: We made the trip to Cotes Mill. I remember it well – our daughter was still quite small and it was one of the first days since she arrived that we’d been out together as a couple, leaving her in the care of my parents. It felt like a great adventure and Cotes Mill didn’t disappoint! The location is stunning and we picked up so many great ideas for our house project. Helen – Has the kitchen proved a good choice!?! Hannah: It’s been fantastic. Aesthetically, it’s just so pleasing. 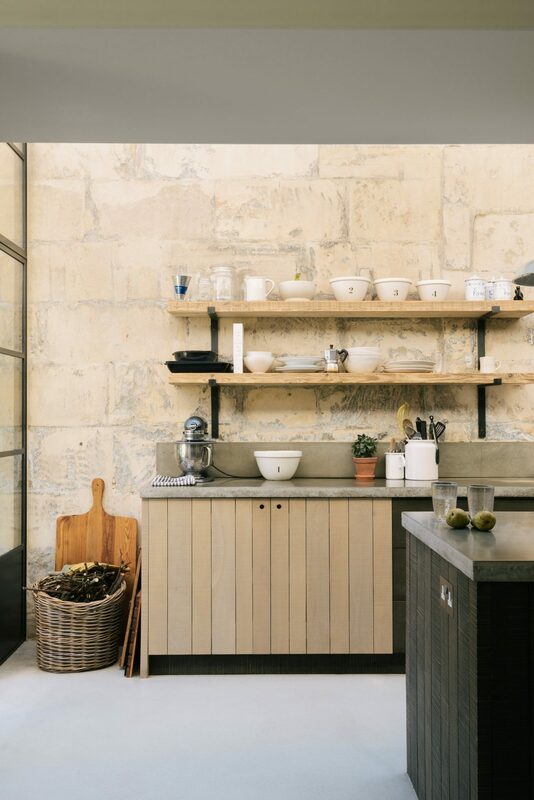 The inky wash of colours compliment the Bath Stone wall that we incorporated into the kitchen, and offset our industrial concrete counters and Crittall-style doors perfectly. From a more practical point of view, there are also hidden benefits! It turns out that a toddler can’t easily open the cupboards thanks to the lack of obvious external handles. It’s my ideal kitchen! 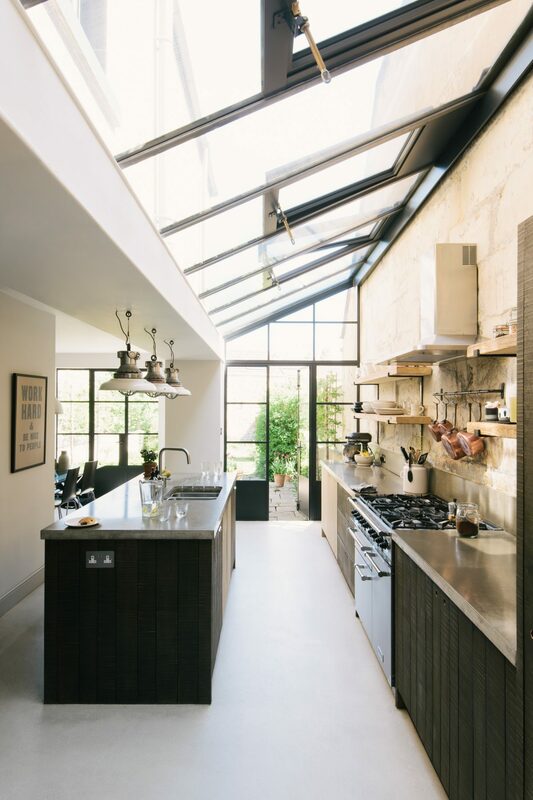 Helen – Do you think kitchen and interior styles move as quickly as food and fashion trends? Hannah: The fashion industry’s desired obsolescence keeps it moving at a faster pace than interiors and food, but a watchword that can be applied to all three at the moment is sustainability. Michael has always been conscious of working with local producers, supporting independent suppliers and reducing food miles. At Maze we present collections with a timeless quality – clothes made to be lived in and loved, not fast fashion. 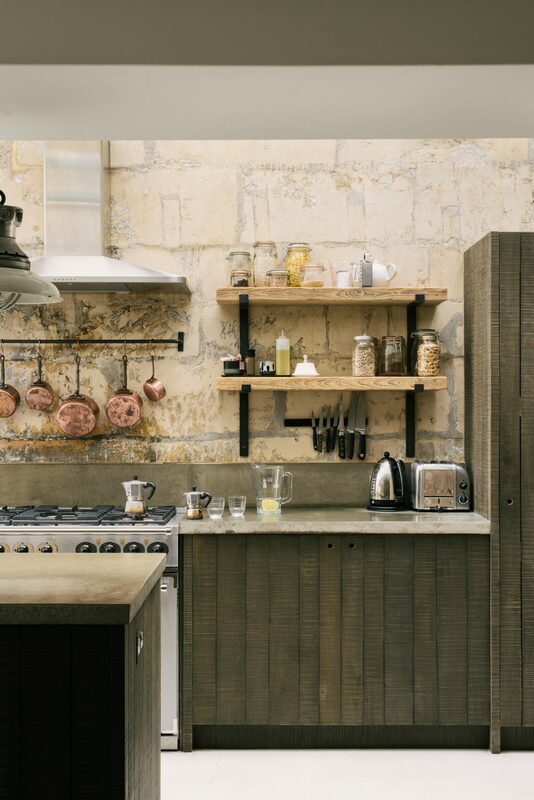 I love that the Sebastian Cox Kitchen uses only sustainable timbers that are all grown in England. Helen – Do you think your love of fashion has anything to do with choosing Sebastian Cox as a style of kitchen? Absolutely. The things I love about fashion are reflected in the Sebastian Cox Kitchen– simplicity, elegance, and craftsmanship. At first glance the kitchen looks very understated but the beauty is in the detail. These are the same qualities that we look for in the clothes we buy. 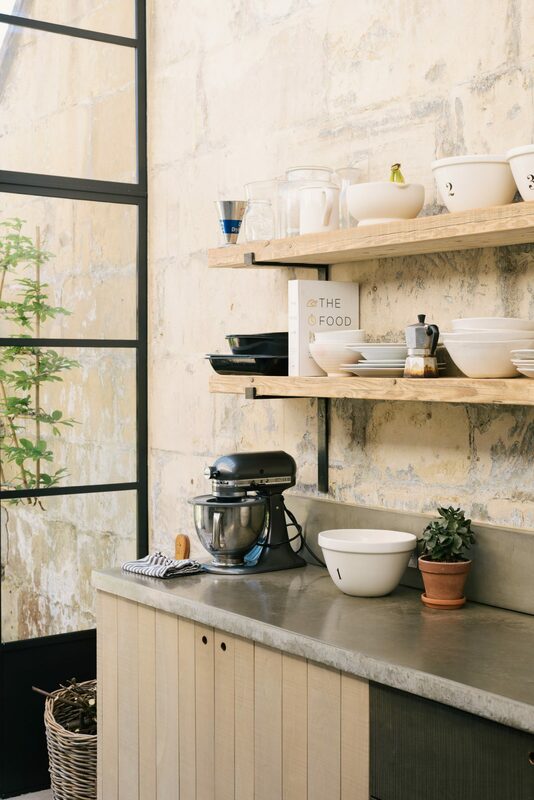 I’m always drawn to collections that have an honesty of design and sense of material – elements that are central to the Sebastian Cox Kitchen. 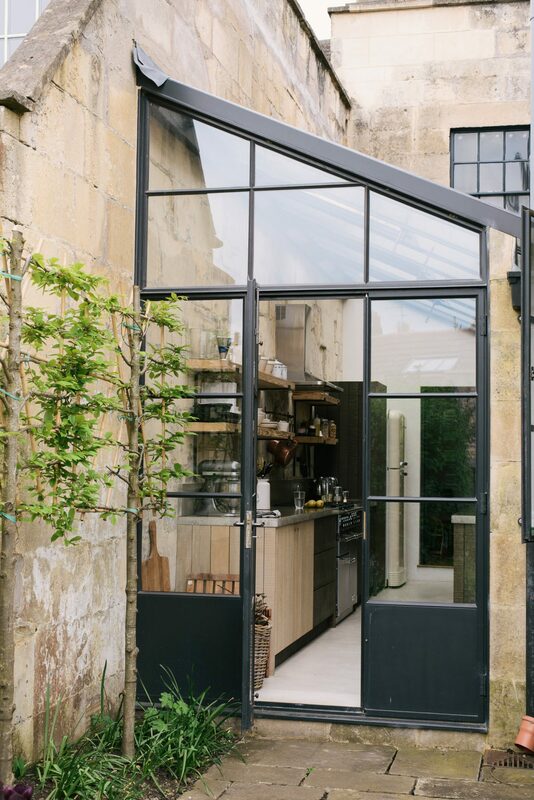 A view through Crittall-style doors into this cool Sebastian Cox Kitchen. Helen – Even though your husband is a chef did you get a say in the kitchen, does he take on board your ideas? Hannah: The kitchen design was definitely a joint effort. I had very strong ideas about how it would look and Michael was fastidious about the functionality. Together I think we produced a pretty excellent space – practical and beautiful! Helen – Do you get involved in the design of your shops and website? Hannah: Absolutely. The business is an extension of my family’s personal style and this feeds into every decision we make from the way we fit out the shops to how we edit the collections and present the clothes. Michael and I designed and built the Maze website a few years ago and we’ve just refurbished our Clifton store to create a lighter, more contemporary environment for the clothes. Helen – How would you describe the fashion you sell and what type of people does it appeal to? Is it based on simple classic style or up-to-date on-trend fashion? Hannah: We promote quietly confident clothes for men and women; fashion that’s easy to wear, at a variety of price points. We have a very broad audience. Customers tend to start shopping with us around 25 and our ‘bullseye customer’ is 32-52, but we sell all the way up to age 70, 80 even. We think style should be ageless and by curating the clothes by colour, rather than keeping them in collections, we hope to remove some of the assumptions people may have about which labels they ‘should’ wear. Helen – Do you buy clothes from anywhere else!! If so, where? Hannah: I don’t have time to shop anywhere else! I usually wear pieces from the collections we stock – Bellerose and Samsoe & Samsoe are current favourites – but if I did venture out and about, I’d probably treat myself to something by Margaret Howell – a contemporary British designer who exemplifies good design and thoughtful style. Our Inky Blue/Black stain has been used on the textured cupboards. So that’s Hannah and Michael, thank you both so much for chatting to me, I really hope everyone finds this as interesting as I did and that it gives you some inspiration if you are thinking about a wedding, a new wardrobe or a Sebastian Cox Kitchen. Please check out Hannah and Michael’s websites, start following Hannah on Instagram and ours if you don’t already!!! Links below. – Hannah’s sustainable fashion website ‘Maze’ and Instagram page. – Michael’s catering website ‘Wild Fork West’.